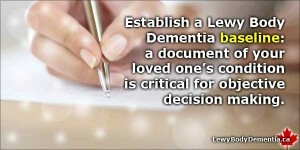 Establish a Lewy Body Dementia baseline that covers key criteria. Periodically update it for comparison and as a foundation for objective decisions: a journal of the journey. Before a crisis hits, prepare. Today. Start Now. Create and keep a document of your loved one’s condition. This could include simple health data, plus norms, aberrations, durations, medications, and changes. Lewy Body Dementia (LBD) fluctuates greatly, and knowing its norms, extremes, and trends will make the journey better. Notes with dates will also allow you to be realistic (instead of pessimistic or optimistic) in your recollections of how things used to be in comparison. This is critical for objective decision making. During a crisis, relying on memory alone is challenging — and memory often changes the facts. Having good notes will help you know for certain if something happened before, how long ago it was, and how it resolved. Medical appointments are another instance where having written info is very useful. It will help make informed decisions about proposed medication changes, potential concerns, symptoms to watch out for and more. Add to your notes during all medical appointments, and in any ER visits as well. Recognizing Delirium vs. Dementia is Clearer with a Baseline. Knowing what is normal will help recognize and detect delirium in a hospital visit. Delirium is very different from dementia, but is frequently mistaken. You need to know the baseline to recognize and be able to explain the differences so delirium-induced behaviours do not result in improper treatment. Prescribing the wrong medication for Dementia with Lewy Bodies by misdiagnosing delirium can have catastrophic results. Knowing the baseline behaviours and routines will help avoid the wrong treatment being administered. As the Mayo Clinic says, “Because symptoms of delirium and dementia can be similar, input from a family member or caregiver may be important for a doctor to make an accurate diagnosis”, and knowing it’s delirium and not their normal state may help prevent a catastrophic reaction from a medication such as Haldol/Halperidol, or the non administering of a helpful medication because the patient is wrongly deemed to be beyond hope. Keep Notes. And Have Copies In Both Print and Electronic Form. A simple notebook for regularly updated, hand written notes is very effective, and portable. Keep key points in a document that can be accessed by a smartphone or mobile device, so all your bases are covered, and you have backup in case of loss. If you’re more comfortable on a computer, make your notes there, and periodically print it out. Details to put in your document include regularly updated numbers for blood pressure and temperature. The “norms” for a person with LBD may be very different than the norms of the general population, yet not pose a problem in the case of your loved one. Knowing this will avoid worries that things are dire if their typical norms are — to others — abnormal. For example, if you go to the hospital, and are told that an 80/45 blood pressure is a critical emergency, but in your loved one’s case, it’s a daily occurrence, that knowledge will make everyone’s life smoother, and avoid potentially disruptive, unnecessary interventions. A Picture of Lewy is Worth A Thousand Notes. Taking a photo of specific aspects is highly useful, and simple for many with the camera capacity of most current smart phones. Whatever you shoot, make sure you have a backup of it somewhere: on a computer or printed (with the date) or both. Your photographic baseline elements could include skin conditions, the degree of Lewy Lean when standing or seated, facial mask, etc. These change over time, and it would be very difficult to describe succinctly. Video is also invaluable, and could illustrate the status of gait issues, tremor, repetitive motion, sleep behaviour and active dreams, speech, eating, and other abilities as they change. Make sure you have some way to back this up as well. I have used this to provide visuals or show atypical behaviours to our specialists, and it has always been well-received. I could not, for example, have easily explained the combination of REM Sleep Behavior Disorder combined with Sleep Apnea, but the video instantly ensured a positive diagnosis, and has been useful to review a couple of years later to show that it has not worsened. Tough decisions constantly have to be made when caring for someone with cognitive issues. Having “baseline” data, dates and details will be invaluable, and will allow decision making to be clearer, and less based on emotion. Include dates for everything, so you can detect trends, triggers, and just how wild the Lewy-caused variations can be. The top two details to keep track of are blood pressure and temperature. Take these regularly, so you know if they vary, and if so, by how much, particularly blood pressure. Try to get readings in different situations: at varying times of day, when lying down, seated, and standing (if it’s safe). Typical blood pressures and temperatures vary between individuals, particularly the frail, and you may find them consistently different than the norms of the general population. Items for Lewy Body Dementia Baseline. Keep notes on all, as you see fit. But even if you only do this infrequently, it will begin to help you track how things are going, and may allow you to make somewhat more realistic predictions. Choose from the items below — start simple, and add as you go along, although having more information when you start, even if it seems irrelevant now, will be useful later. Keep track of current, normal states, benchmarks, and all changes in intensity, frequency, etc. It is easy to start this type of log, and easy to maintain. Even easier is to never start it at all — but even if you only note a few things once, and then go back much later, at least you will have some idea of what things were like in relation to the current state. That will help you make informed decisions. Better decisions. And the best decisions we can make will make the lives of our loved ones infinitely better. P.S. One final reminder — make at least one copy of your baseline documentation. Be it written, digital, photographic or audio-video, make sure you have it backed up. It is shockingly easy to lose things, or to have data accidentally erased or inaccessible. Learn more about Delirium with this thorough journal article, and more information tied to malpractice is available in this article on the risks and differences between dementia and delirium. Still to come….sample document of baseline information. Thanks for this information. His main problems out of all these is blood pressure fluctations , stiffness in his feet trying to put his pants on, wanting to sleep most of the day if we aren’t going to therapy or out to eat or doing his exercises at home. He has a lot of back and leg pain.turning in bed or getting up and after walking with his walker for a few minutes. If I ask him what did someone say on tv. he always says I don’t know. He dreams a lot at night,but has done that most of his life. His balance isn’t good. He has no tremors and usually is in a good mood . Has a problem with constipation but drinks miralax at night. I wanted to share these with you since you seem to know a lot about all these. Thanks for the details. I think there are a great number of people who wonder what is “common” with Lewy Body Dementia, and this is a good summary of your experience. You’re doing an incredible thing for your loved one. Very inspiring! Strength to you. This is soooo overwhelming! Do you happen to have a chart or a suggestion on how to keep track? I’m not being lazy, but I have notebooks I’ve started in different ways, and am really trying to get it all organized and begin keeping better records. Thank you for all the knowledge you impart! Hi there. Sorry things are so overwhelming. It’s almost impossible not to be overwhelmed when dealing with the countless challenges of dementia with Lewy Bodies. I do not (yet) have a chart, but I will think about this. I kept quite extensive records, and baseline information, regular blood-pressure readings, general condition, hospital trips, doctor visits, medication changes, unusual changes, activity ability, sleep, etc. The key to any set of records, no matter how simple or extravagant, is to have them available to access, and easy to update. For this, I found my phone most useful, since I have it with me 24-7. It doesn’t work well for any long-form notes, but works fine for basic points, and I also can use it for quick video or audio recordings (which I recommend highly for medical appointments, both to illustrate symptoms or concerns that don’t happen at the doctor’s office, but equally so because I could not retain all the info the specialists would typically provide in an visit, and would refer back to the recordings later, but always check to make sure they’re OK with recording the consultation). Hope you can make progress. You’re doing an amazing thing for your loved one!